It’s certainly the funkiest car we’ve seen from Jeep – but is there substance to back up the style? Considering Jeep is a company that’s been building SUVs years before they were being referred to as SUVs, it’s a surprise that it’s taken the company so long to make a more compact car along the lines of the Renegade. As a result of its late arrival, the Jeep Renegade comes into the compact crossover market at a time where so many good cars are contesting for class honours. It would take a stellar car to be competitive in this segment now – so it’s refreshing to hear the Jeep Renegade can actually get stuck in with the big boys. Like the exterior – chunky, well built and hiding a few ‘Easter Eggs’. Yes, you’ll find a few bits of Fiat-sourced switchgear if you really look hard. From the outside, you’d be hard pressed to find any real similarities between the Jeep Renegade and the Fiat 500X – in spite of the fact they’re built on the same platform, and are assembled in the same factory. That trend also extends for the most part to the interior, too, with that same upright styling cues that characterise the exterior of the car translating well to the cabin. Yes, you’ll find a few bits of Fiat-sourced switchgear if you really look hard (the air-con controls and multimedia interface in the Jeep are identical to the ones you’ll find in the 500X), but the rest of the interior feels unique to the Renegade. 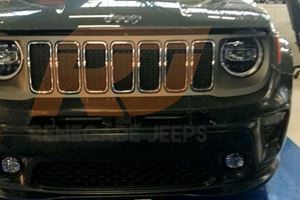 Having neat little styling quirks also helps differentiate the Jeep from other cars in this class, ranging from a chunky grab handle above the glove box to less important features like the tachometer redline being marked out by a mud splatter sticker or the seven-slot Jeep grille motif engraved into the side of the rear view mirror. More useful in day-to-day life will undoubtedly be the storage cubbies, which are as accommodating as they are plentiful. Likewise, the rear seats won’t impede larger passengers too much either – leg room is a bit limited, and the middle seat is rather narrow, but the boxy proportions of the Jeep Renegade means there’s a surprising amount of head room on offer. Those same boxy proportions also allow the Jeep Renegade to have a decent-sized trunk, with the 18 cubic feet capacity putting it on par with an Audi Q3 and Fiat 500X. However, the trunk space itself isn’t particularly long, so you will need to fold the rear seat backs down in order to stow larger items in lengthways. That said, all models do get a movable false floor, which can be used to make the trunk that bit deeper – meaning you should be able to stack a few suitcases on top of each other and still have a wee bit of room to spare. Of course, many Jeep Renegade buyers won’t be taking their cars on dusty trails or fording through gushing torrents. Understandably for a Jeep, the Renegade wears its off-roading heritage on its sleeve (in years gone by, the Renegade name was used on a trim level for the hardy CJ series and its equally sturdy Wrangler successor). Not only are regular Jeep Renegade models emblazoned with chunky body panel additions and a lofty-by-crossover-standards ride height, but it also has genuine off-road ability – when fitted with the Trailhawk package, the Jeep Renegade will have no problems when tackling the 22-mile Rubicon Trail. Of course, many Jeep Renegade buyers won’t be taking their cars on dusty trails or fording through gushing torrents. But it is encouraging to know that even the lowlier models should survive almost anything you can throw at it this side of a mudslide. Ride quality’s also a bit iffy at slower speeds, though does smooth out when you pick up the pace. It’s just a shame, then, that the Jeep Renegade isn’t quite as impressive when you take it back onto the asphalt. Though there’s nothing fundamentally wrong with the way the car drives, it’s also lagging behind the class leaders in quite a few areas – namely, refinement levels. Not only are the engines a bit gruff in comparison with like-for-like units in rival cars, but the car’s bluff shape and boxy wing mirrors do generate a substantial amount of wing noise at highway speeds. Ride quality’s also a bit iffy at slower speeds (one of the very few traits the Jeep Renegade shares with the Fiat 500X), though does smooth out when you pick up the pace, and we’d prefer the steering to be a little less numb so we can have a better idea of which direction the front wheels are pointing. That said, the Jeep Renegade does do some normal driving mode things well. Having a large, letterbox-style windshield and surprisingly slim front pillars means you’ve got a great view out front, with the subtle bulge in the hood giving you a good reference point that makes up for not being able to see the front of the car from the driver’s seat. That numb steering is also pretty light and responsive, so you can intuitively get used to the lack of feedback through the wheel as you spend more and more time with the Jeep Renegade. Anyone who’s been looking at the Fiat 500X will experience a bit of déjà vu with the Jeep Renegade’s powertrain line-up, as they’re identical to each other: you’ve either a choice of a 1.4-liter four-cylinder gasoline engine with a six-speed manual, or a 2.4-liter four-cylinder gasoline engine fitted with a nine-speed automatic. It’s officially a ‘choice’, but the truth is many buyers will likely find themselves with the larger of the two engines, as the 1.4-liter is only offered on the most basic of Jeep Renegade models. And, as with the Fiat 500X, we’re confused as to why the smaller engine isn’t offered throughout the Renegade range, as we feel it’s the better of the pair. Whilst the gear changes are smooth, it does take its time to decide whether to change up or drop down a gear. Though lacking a bit in outright straight line pace, the 1.4-liter has enough torque to get this chunky little Tonka toy of a crossover up to a decent speed, with the six-speed manual being pleasant to use and allowing the driver to select the gear they want. Plus, with claimed economy figures of 24mpg in the city and 31mpg on the highway for front-wheel drive and all-wheel drive models, it’s marginally superior to the 2.4-liter in terms of fuel consumption. Despite the inferiority of and our preference against the 2.4-liter, it’s still a good engine that’s marginally more refined than the 1.4-liter (if still a little bit gruff at higher revs), and is still fairly frugal (even the least efficient 2.4-liter models can return 21mpg in the city and 29mpg on the highway. Choosing this engine also means you’ll have enough poke to overcome those rutted trails, if tackling off-road courses is your kind of thing. The only reason we do have hesitancy over the 2.4-liter engine, though, is the fact it’s paired to a rather dim-witted nine-speed automatic transmission. Whilst the gear changes are smooth, it does take its time to decide whether to change up or drop down a gear – especially during overtaking manoeuvres on highways. It’s not intrusive enough for it to be a huge problem, but there’s no denying it’s behind what we’d expect from a modern-day automatic, and has the potential to be a really irritating feature in the long term. Jeep Renegades in that entry-level are fairly sparse on equipment. Browse through the spec sheets on the Jeep Renegade, and you’ll probably be startled by the starting MSRP for the range: an incredible $17,995. For reference, that’s more than two grand less than its already rather affordable sister car, the Fiat 500X, and puts the Jeep Renegade right in the heart of entry-level Ford Focus territory. Jeep Renegades in that entry-level (and rather inappropriately named ‘Sport’ trim) are fairly sparse on equipment, however. Though it’s nice to have hill start assist and 60:40 split-folding rear seats, it’s a shame that you need to fork out another $1,495 to add air-conditioning and cruise control. 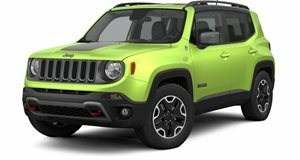 In fact, by the time you’ve loaded up all the useful options onto the entry-level Jeep Renegade, you’re up into the MSRPs for the Latitude trim level – which, on top of having the Sport’s optional air-con, cruise control, touchscreen interface, reversing camera and alloy wheels as standard, also gets goodies like a leather-wrapped steering wheel, extra storage pockets in the front seat backs and the option to upgrade to an even bigger touchscreen with built-in navigation. Regardless of which Jeep Renegade you do go for, you’re guaranteed some strong residual values. Of the two, we’re more inclined to recommend the Latitute trim over the Sport, in spite of the fact the former has our least favourite engine and transmission combo in the range. However, if you can live without the nav system and the leather steering wheel, the loaded Sport model should do you fine. Climbing all the way to the top of the Jeep Renegade pecking order gets you to Limited trim and Trailhawk package territory, with the former offering nice luxuries (namely heated leather seats, dual-zone air-conditioning and 40:20:40 split-folding rear seats). That said, both are of niche appeal – the Limited puts Renegade pricing up to the $27,000 mark, and the Trailhawk is more engineered for life in the rough than on Route 95, so they’re not the packages we’d instantly recommend. Regardless of which Jeep Renegade you do go for, you’re guaranteed some strong residual values. Much like the Fiat 500X it shares so much with, the Renegade is expected to hold onto its value rather well, especially in comparison with competitors like the Honda H-RV and Chevrolet Trax. Like we said earlier, only a very good overall car can have a hope of succeeding in the compact crossover class now. Why go for something that’s merely okay, when you’ve got so many other alternatives to choose from? Thankfully for Jeep’s sake, the Renegade does deserve to be considered by the compact SUV buying populace. Yes, it does have problems (mainly regarding iffy refinement and a jiggly low speed ride), but the rest of the car is so good that, we feel, it’s more than worth keeping on your radar. The same derelict Jeep gets a new rebellious face. 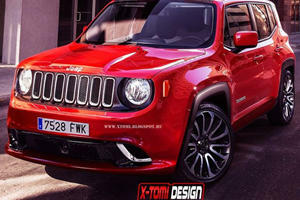 Jeep Won't Rule Out A Renegade Trackhawk But Who Would Buy It? Soccer moms rushing to Costco? 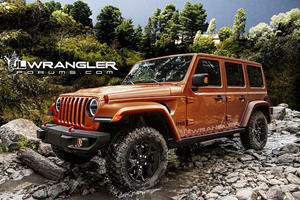 The 2018 Wrangler will be one of the most customizable cars on the market.